A California man in his 60s has died after police subdued him with a Taser. Authorities say he verbally and physically assaulted officers. Police also arrested the victim’s brother, who they said threatened them with a handgun and barricaded himself in a house. The fatal interaction between the Burbank PD officers and 66-year-old Thomas Binkley took place Tuesday evening, when a woman reported criminal threats. The caller said Binkley was her ex-father-in-law, who came to her house and was making threats on her life. Two officers responded to the call, which came from a private house in the 500 block of N. Mariposa St.
“While speaking with the officers, Thomas Binkley became verbally confrontational and ultimately physically assaulted the officers,” the Burbank police said in a press release. — BurbankPD (@BurbankPD) 5 октября 2016 г. To stop the assault, one of the officers discharged his stun gun and hit Binkley. In the meantime, a second man, later identified as Binkley’s 65-year-old brother Steve, appeared in a doorway, waving a gun at police officers. “This forced the officers to reposition themselves behind cover and call for assistance,” Burbank PD said. Steve Binkley barricaded himself inside the house and stayed there for about 40 minutes, according to police estimates. While the armed suspect remained fortified within the house, officers were trying to help his brother. They were able to rescue him during the barricade situation and remove him from the immediate area. Thomas Binkley was treated by paramedics at the scene, but was later pronounced dead. The immediate cause of death was not available and an autopsy by the Los Angeles County Coroner’s Office is now pending. Steve Binkley, who was detained and arrested, is set to appear in court Friday. He is currently being held in-lieu of $25,000 bail at Burbank City Jail on one count of threatening behavior. Steve Binkley’s gun was later found during the search inside the house. The Binkleys’ friends are grieving the loss of Thomas, who they described to the media as a nice man. “He was an awesome man, he was a scuba diver, he took care of everybody. He was just a great person,” a woman told KTLA Wednesday. Taser International, which works with more than 18,000 law enforcement agencies across the US, say its devices are employed 904 times per day, or every 2 minutes. The billion-dollar company does not, however, say how many people die from its stun guns. 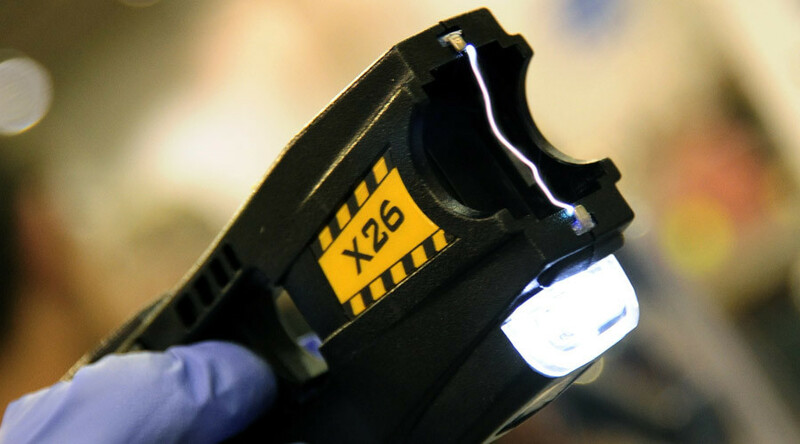 Last year saw 48 people dying after police used stun guns, but in many cases the link between deaths and use of Tasers can be unclear. Yet, media estimates show that in nearly a half of cases medical mention deployment of Tasers in autopsy reports. Thus, Washington Post managed to obtain reports in 26 of 48 cases. Twelve of them were related to stun guns. A 2011 study by the National Institute of Justice showed that deaths following Taser use are rare and usually a shot less than 15 seconds does not do any harm. The study did say that such “exposure” may contribute to “stress,” and stress may be an issue related to cause-of-death determination.